Resolvins, like autophagy, are part of the new emerging science of how homeostasis (natural balance) actually works in your body. This represents another way to deal with pain. Typical medications simply try to block pain or even “deaden” nerve signaling, potentially getting in the way of proper nerve and immune cell communication that properly terminates pain and helps naturally complete the repair process. I’m certainly not saying a person should never use pain medication. I am saying that many natural strategies to improve pain, including the use of enzymes that help autophagy clean up trash better in an injured area, work by principles of speeding up the resolution of pain and can be employed so that a minimal amount of pain medication can be used, if it is needed at all. Of course, resolvins will work synergistically with other nutrients to help manage repair and pain. For example, vitamin D has now been shown to help chronic pain because it puts a lid on how much inflammation can take place. 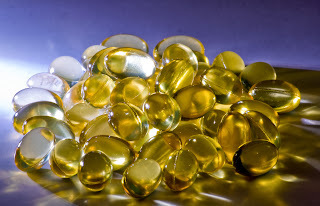 If you lack vitamin D pain can self-perpetuate due to an inflammatory immune system overload. Pain from a fracture that doesn’t heal properly can actually spread and cause widespread pain if you lack vitamin K.
Higher amounts of nutrients like DHA can be quite helpful to deal with problems of acute or ongoing pain.